A person pretty much has to live under a rock not to know about the #MeToo movement these days. So very many women are feeling, for the first time, they can speak out and have their sexual harassment and their sexual assault validated. It is a time of incredible empowerment for many women. A time of validation and public support on an issue that has been invalidated for so long. It’s been powerful to watch many women step forward courageously to say, “#MeToo”. No one will believe me if I say anything. No one will do anything if I say anything. The best way to not get hurt further is to stay silent. I’ll speak up and say I was harassed/assaulted/threatened/coerced. And if I can say it happened to me, maybe you’ll know it’s ok to say it happened to you, too. I happen to be fully in favour of “me too” not only to women who have been violated but in life–in relationships of all sorts. When I lead The Daring Way™ groups, one of the most powerful outcomes is that people have a chance to know they are not alone in self-judgement, in hiding parts of themselves from others, in being fearful of vulnerability. To see that others also struggle with pain that otherwise doesn’t get mentioned is a deeply unifying feeling. That feeling gives a warm, loving sensation that is priceless. I’m glad that women are hearing others use their voice in ways that feel good. However, today I’m writing to you, the woman who is feeling raw and scraped over with the in your face-ness of the news cycle right now. Many women are coming forward, outlining events of assault, degradation, coercive acts, and sexual harassment over the last decades. We are being bombarded with many women telling many painful stories. They are stories that need to be told. And heard. There is healing happening, and I’m all about healing! Let the awareness development continue! However, there is a hidden cost to this…and I want to let you, the woman who is paying the price of #metoo, know that we see you, too. You matter also. The pain that bubbles up for you as you see more stories on the news, or more pictures/tweets etc. on social media is important. Your hurt is often buried…and lately, that pain has been disturbed, unearthed, and feels like the whole world is looking at it. Women traumatized by sexual violence are feeling very raw these days. And I want you to know that it’s probably too hard to talk about how hard the #MeToo movement is for you…so I wanted you to know that you are not the only one. Talk to any therapist these days, and they will tell you that there are many clients who are drowning in hearing all the stories and all the pain of the women coming forward. The very brave acts that were shared to be a communal pronouncement of healing has, for some of you, the opposite effect. 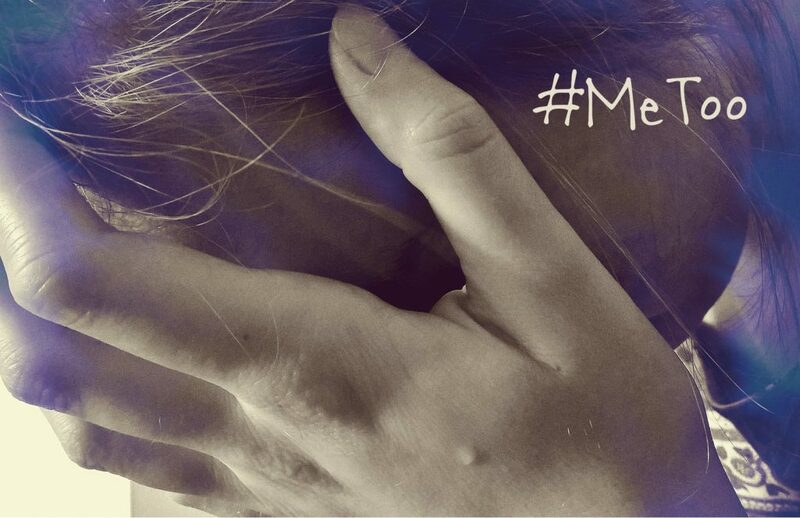 The #MeToo makes the news hard for you to watch; has you feel punched in the gut as you seek solace from social media and then see #MeToo there as well. There’s almost no escaping the conversation, and for you, that’s deeply triggering–your own trauma is again front and centre in your life, even after all the hard work you’ve done to deal with the trauma. For a woman who is significantly traumatized by her experience of violation, and who cope by trying to live in the present and not have the past intrude into the present, simply: #MeToo is hard. It scrapes open your barely concealed memories so that they become front and centre again. To hear the pain of one, and then another, and then another, and another compounds your own. When it is hard to hold your own pain without drowning in it, it becomes overwhelming when others share theirs, isn’t it? You understand that their sharing is intended to help. That doesn’t stop their brave news from weighing you down. It serves to push you further under the water that threatens your very breath. It’s hard when the healing of others comes at the cost of yours, isn’t it? And then, there’s the news, where as the women come forward, the court of public opinion holds a trial: Should her story be believed? Is she credible? Why didn’t she come forward sooner? Gosh, that reminds you far too much about your own experience, doesn’t it? Women are doubted, questioned, and heard with suspicion. That victim blaming/abandonment hits way too close to home for you. Second: the disbelief, blaming the victim, lack of support and understanding from those who, theoretically, are in a position to support you. The ones who you hope are in your corner suddenly turn against you. The #MeToo movement is intended to be one of support and validation…and for many, it has been. But as women have come forward with #MeToo, many are doubting their stories. Some of the men accused of sexual violation are owning their terrible behavior, but others are denying it vehemently. Those accused perpetrators who are calling their victims dishonest and manipulative reminds you far too much of your own experience. So many of you were quietly told to disappear while he continued in his role, or you got laid off while he got promoted. Even if you were believed, people protected him from the natural consequences of his abusive behavior. That left you to pay the harsh price of his actions. When you watch the brave women come forward to be questioned and interrogated and doubted–well, it echos your own horrible experiences of trying to tell someone and not being heard. The pain of seeing others being doubted the way you experienced being doubted: Too. Much. To. Bear. Even as so much good public discourse has arisen with #MeToo, there has also been pain. The movement was initially started by Tarana Burke in 2006 to create empowerment through empathy for women of colour who experienced sexual assault, particularly in underprivileged communities. As the term has caught fire and spread widely, women of colour and marginalized women can feel further marginalized with the term being used widely and broadly by all women. As prominent white celebrities embrace this as their own, the violence on marginalized women recedes into the background…again. Some of you read this as men…and say, “Me too”…and feel like the hashtag tidal wave doesn’t include you as a man who was sexually violated by a person in a position of power over you. Know that you too, as a male, are included in this letter of support. Your hurt matters. It wasn’t your fault. Sexual intrusiveness hurts. Full stop. There are many conversation about #MeToo happening these days. A lot of them are positive. I hope the talk about “MeToo makes the world safer for all little girls growing up. Let’s keep the conversation going. However, I want to say that many recognize that this is not an easy time for those who have been affected by being assaulted, seduced, coerced, manipulated, threatened, violated, disrespected in their lives. Many of you are yet too wounded to join in #MeToo, and to see sexual violence so out there publicly hurts. I’m sorry that this is hard. Please know that we respect when, intuitively, you know that it’s not wise for you to post #MeToo on your social media. If it’s not right for you to do it–please don’t! We support you in doing what is right for you. We want you to work towards healing in whatever is the best way for you. We are sorry that you have to see the world struggle with the reality of sexual violation. The world is trying to get to a place where sexual violence is always condemned, but you are seeing the labor pains of a movement not yet fully birthed. There are doubters, there are the shamers, there are those who can’t/won’t see their own behavior as wrong. Sorry that you have to see the world struggle with trusting those that have been violated like yourself. There have been a few who have let me into their pain around #MeToo. Not posted on social media…just told me. Privately. I was honoured to hear it. Person-who-has-been-further-traumatized-by-#MeToo…can you tell one trusted person that you are struggling with the news and social media these days because of it? Let one trusted person be compassionate to your pain…so that you know that you are not alone.